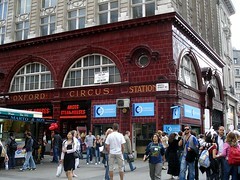 Zone 1 Tube station on the Central, Victoria, and Bakerloo lines, geographically located halfway down Oxford Street where it intersects with Regent Street. It is constantly overrun with tourists and this, combined with the many office and shop workers in the area, make it one of the busiest stations on the Tube network. It can be rather tricky to find your way out, too. Last edited 2008-06-09 17:49:11 (version 5; diff). List all versions. Page last edited 2008-06-09 17:49:11 (version 5).